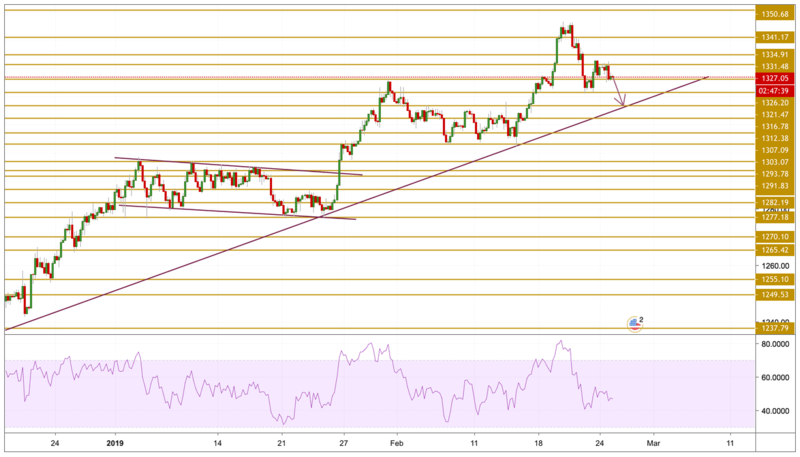 The XAU/USD pair failed to hold above the $1330 mark on Monday and came under modest bearish pressure in the second half of the day. Heightened optimism about the possibility of the U.S. and China reaching a trade deal made it difficult for safe-havens to find demand on Monday after U.S. President Trump announced that he delayed the increase in tariffs on Chinese imports that was originally scheduled to go into effect on March 1. The risk-on mood allowed investors to focus on risk-sensitive stocks and indices. Additionally, the upsurge seen in the T-bond yields supported the greenback in the second half of the day and helped the US dollar pull away from its daily lows. Gold prices failed to hold above the $1330 level after numerous attempts and declined towards the $1326.2 support level. The price is currently hovering around the $1327 level with a declining momentum as we can see on the RSI. We will be expecting a deeper correction to the downside and we will be focusing on the $1316 .78 level.